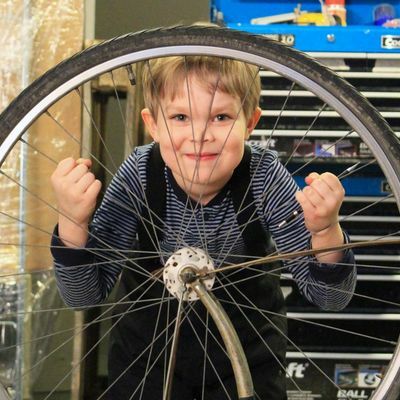 After a nomadic year 2013 of Trashlab repair workshops touring different studios and maker­ spaces in Helsinki, the activity in 2014 has now settled into Kaupunkiverstas, the city library´s maker­ space in Lasipalatsi. 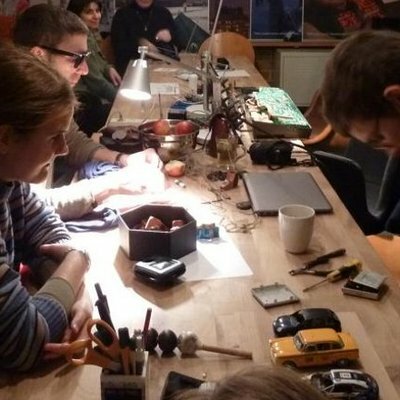 The maker­ space is a recent initative by the library, which responds to the library´s users feedback and ideas of an open workshop space. Trashlab­ activists also had a role in the development of the space and it´s facilities: Albert Laine, Eero Yli-Vakkuri, Andrew Paterson and myself (Päivi Raivio) participated in the co­-planning process during a workshop organised by the city library in Aalto University´s maker­space Aalto FabLab. It is rewarding to see the space now in action, and open for cooperation with independent initiatives like Trashlab. We are there on the first Tuesday of each month between 16-19. 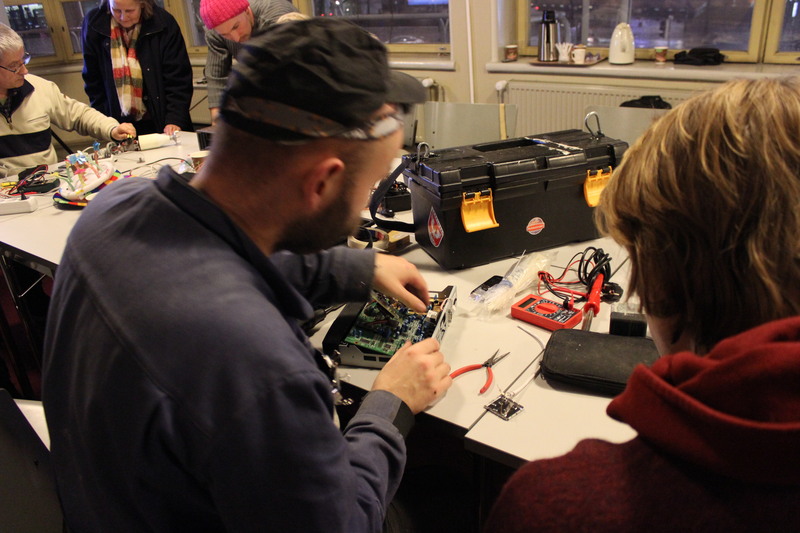 While Trashlab´s focus has recently been in organising repair­ workshops and raising awareness of DIY repair-­skills, it will, purposelly remain undefined about what we all mean by fixing, what is trash/waste or even what are appropriate skills. 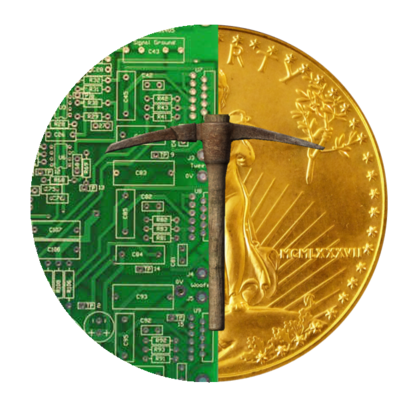 The spectrum of Trashlab will remain as wide as possible, allowing people, with different scopes of interest to develop and define the meanings with us. Regular repair meetings have a great potential to become one of the Kaupunkiverstas basic services. Just like borrowing a book, we could get tools and advice for fixing our broken devices and personal items, to prevent waste by increasing the lifecycle and use of them. In addition to the basic knowledge of fixing, we constantly need new creative ways to use waste, deal with waste, and avoid it. 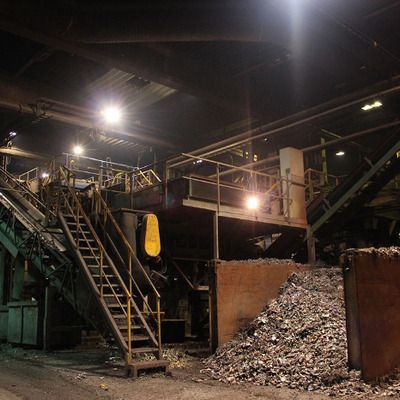 This is because the issue and problematics of waste are more and more complex, and it is necessary to also consider the subject at larger management and system levels. We have planned the year´s programme (see within Pixelversity 2014 schedule) keeping a broad approach in mind. In addition to the monthly Trashlabs, we will do waste related field trips, extract valuable metal from broken laptops and refine it, aim to build a trash­-raft to Camp Pixelache in Vartiosaari, photograph the world through trash­-lenses, and hopefully compete again in the Recycling Olympic Games. And as always, Trashlab is open for proposals of waste-related activities and ideas. Post: Tule mukaan Kullankaivajat-työpajaan 29.10!